Click here to visit the Snikiddy Snacks facebook and like them. 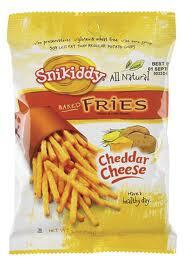 Then on the “like us to win” tab, click the image of the bag of Snikiddy Snacks. Next just fill out the form to enter their sweepstakes. 100 winners will score a Snikiddy Snacks Fan Box. The box includes a Snikiddy hat, art kit, sticker and a bag of Snikiddy. You can enter daily through April 30th. Good luck!